Heading from Quechee to Dorset required a bit of backtracking, but we were driving through lovely Vermont countryside, so we didn't mind. As we were driving through Rutland, Vermont, this store caught Lori's eye. We didn't quite stomp on the brakes, shift into reverse on a busy road, and back up to the store; we merely pulled in at the next parking lot, turned around, and hastened back with all due speed. 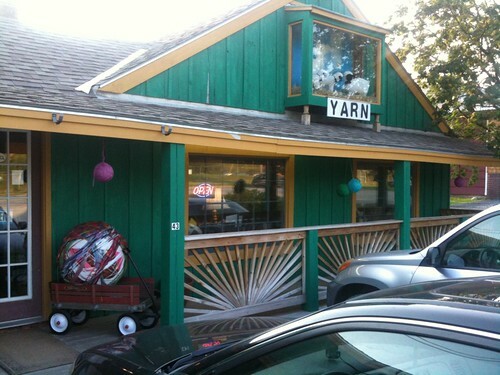 The yarn store had signs in the windows saying "Knit Locally", and a section of advertised-to-be-local yarns. So I ended up asking the proprietor about the virtues of local yarns, with an eye to whether local yarns were distinctive in Roadfoody ways. Was there a distinct character of local yarn? Well, not really, except that they all took their wool to one spinner, and maybe that imparted some general characteristics, but she couldn't really identify anything local. 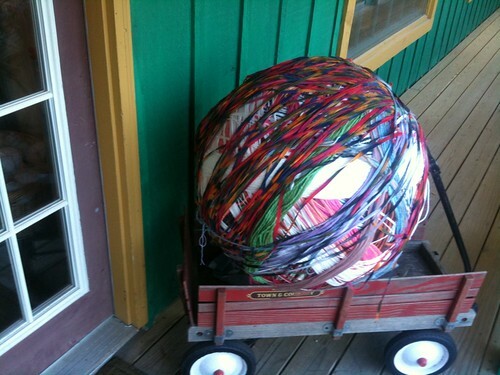 Were there yarns that could only be obtained locally? Yes, there were, but they were all heavy, coarse yarns that weren't very nice to the hand. So I am not really convinced by this "Knit Locally" proposition the way I am about local food.